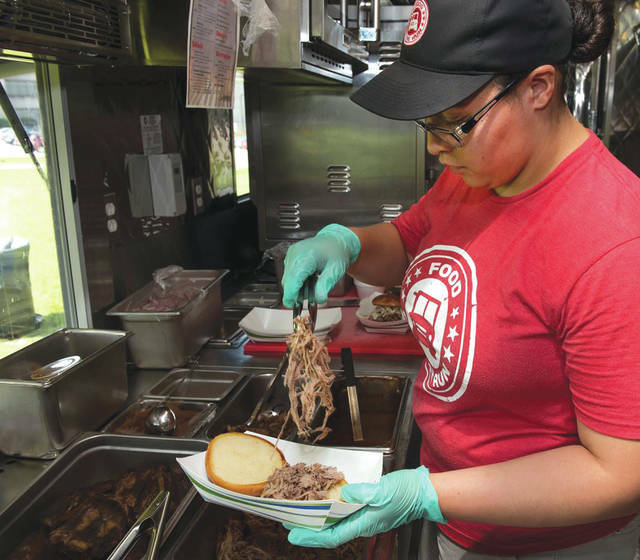 Submitted photo Ashley Huerta piles pulled pork onto a bun Aug. 3 in the 88th Force Support Squadron food truck “On the Run.” The truck, operated by the Wright-Patterson Air Force Base, Ohio, club, rotates through menus including BBQ and Italian fare. WRIGHT-PATTERSON AIR FORCE BASE — The 88th Force Support Squadron of Wright-Patterson Air Force Base has a new food truck named “Food on the Run,” according to Bruce Hiott, club manager for the Wright Patterson Club and Banquet Center. Owned by the 88th Force Support Squadron and operated by the club, the food truck rotates to different locations around Wright-Patterson Air Force Base. “Trying to figure out where the best place for the food truck’s location is the challenge,” said Hiott. “That’s the reason the food truck is in a different location each day of the week. Another challenge is, ‘What does our clientele want to eat?’ With limited clientele, we don’t want the menu to get stagnant, so we will have six cycles,” said Hiott. Wright-Patterson’s Facebook page is the best way to see the menu, location and times the truck is open. Feedback and recommendations are welcomed. “We rely on Facebook for feedback, such as where our clientele wants us and what we should be serving,” said Danielle Burress, chief, Community Services Flight. The food truck is open 11 a.m. to 1 p.m. Monday through Friday. – Friday (Area B): Air Force Research Lab area, adjacent to the Child Development Center and the Firehouse. For additional information concerning the On the Run food truck, call Hiott at 937-257-4004 or email him at bruce.hiott@us.af.mil. https://www.xeniagazette.com/wp-content/uploads/sites/32/2018/08/web1_180803-F-JW079-2047.jpgSubmitted photo Ashley Huerta piles pulled pork onto a bun Aug. 3 in the 88th Force Support Squadron food truck “On the Run.” The truck, operated by the Wright-Patterson Air Force Base, Ohio, club, rotates through menus including BBQ and Italian fare.